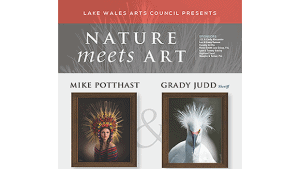 January 3-February 28, The Michael Crews Gallery showcases a special exhibit, Nature Meets Art: Photographs by Polk County Sheriff Grady Judd and accomplished Photographer and Videographer, Mike Potthast. They share their views through the lens, capturing an amazing display of color light and intimate perspectives of Central Florida’s natural world. Gallery hours are Monday-Friday, 10:00 a.m.- 4:00 p.m. Closed on weekends and some Federal holidays. A meet the artists reception takes place on January 10 from 5-7pm. No admission charge.